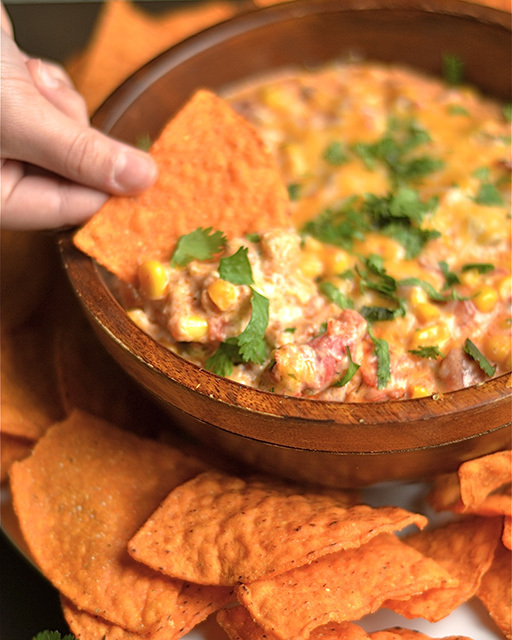 This super easy Instant Pot Cheesy Southwest Corn and Bacon Dip is perfect to serve a crowd! A delicious appetizer that is perfect for any occasion. Bring on the comfort food! Cold weather is the perfect opportunity to stay inside, have a few friends over, and enjoy some simple pleasures in life like hot dip and chips. Gooey melted cheese with some southwest flavors, jalapeño, corn, fresh cilantro, and crispy bacon on top, what could possibly be bad? Serve with a big bowl of tortilla chips, and this easy appetizer is sure to be your new favorite. Move over Nachos!! I’ll be the first to admit, I am not a huge football fan. I somewhat enjoy the background of a football game while doing something productive, or working on my computer. And occasionally, I’ll watch my team play an entire game or tune in here and there. But there is something I do love about football…….football food! 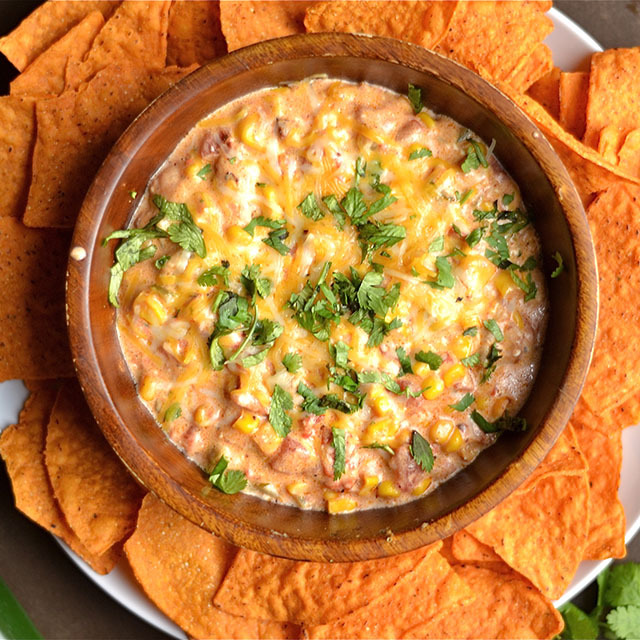 With the Super Bowl just around the corner, this dip is the perfect opportunity to wow your family and friends with the magic powers of the Instant Pot. I use my Instant Pot all the time for dinner, but recently discovered even more ways to hit the easy button. I love that everything is made in the same pot, and no need to dirty extra dishes. Oh and there is also the convenience of having almost anything made in less than 20 minutes. So I played with my Instant Pot and a favorite dip of mine, and tweaked it a bit until it was perfect. The best thing to do is to start by chopping the bacon into small strips. Saute in your instant pot until the bacon is nice and crispy to your liking. It depends on the size of your bacon and your level of bacon love that will determine how many strips to use. I put 4-6 in the recipe (4 for extra thick slices, and 6 for thinner smaller slides). Remove from the Pot, and set aside. You will use the bacon fat to saute corn, onion, and jalapeño. Then dump in the spices, cream cheese, chilis, and tomatoes. Your Instant Pot will cook everything for 5 minutes. Once done, use a quick release. After opening the lid, you will hit cancel. At this point you can add in the cheese, let it melt, and be done by adding the bacon back to the pot! Otherwise if it’s taking the cheddar a bit longer to melt, you can select the saute function. Select the saute function on your Instant Pot. Once hot, drizzle with a bit of oil to coat the bottom of the pan. Add your bacon strips, and cook the strips to your liking of crispiness. Remove the bacon and drain with a paper towel. Reserve the bacon grease. Add onion, corn, and jalapeño to your Instant Pot. Cook until fragrant 4-5 minutes. Add garlic. Mix together the spices, and add to your corn/onion mix. Next add the tomatoes, green chilis, and cream cheese. Secure the lid on your Instant Pot. Press Cancel, and then select the Manual function. Cook on high pressure for 5 minutes. Once your 5 minutes is complete, use a quick release. Remove the lid, and stir in the cheddar cheese and bacon. If the cheese is not melting properly, you can also hit cancel and select saute again to get the dip nice and bubbly. Garnish with fresh cilantro and serve hot with chips!